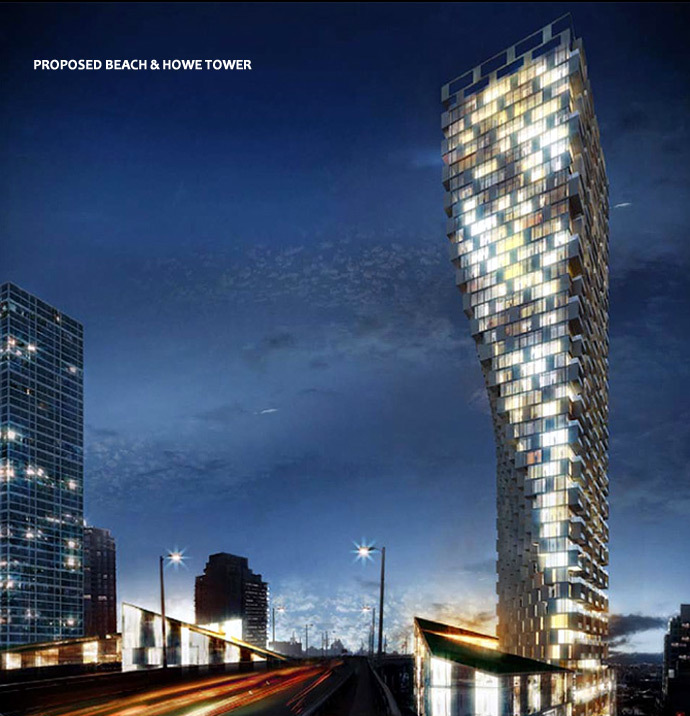 If Westbank's proposal for a 497-foot-tall tower, designed by Danish architect Bjarke Ingels and DIALOG Design, is approved, it promises to inject a cool factor into the Downtown South neighbourhood. "Council envisages a neighbourhood centre under the Granville Bridge that would include a drug store, grocery store and shops and services," McNaney said. Four condominium projects near Westbank's proposed tower are almost complete. Onni's 41-storey, 300-unit Mark at 1372 Seymour Street is one block east of the proposed twisty tower and will be completed within the month. Go north two blocks from the proposed tower and there's Rize Developments' 187-unit, 23-storey Rolston tower at the corner of Granville and Drake streets. It, too, is virtually complete. It is the same story for both Cressey Developments' 215-unit, 32-storey Maddox tower at the corner of Howe and Drake streets and Concert Properties' 194-unit, 33-storey, Salt tower at the corner of Hornby and Drake streets. "We're all within three months of completing our projects," said Hani Lammam, Cressey's vice-president of development. Lammam said new projects bring renewed interest and buyers into the neighbourhood. That's key because, aside from Salt, each of the projects has unsold units. McNaney said council's policy is to remove on-ramps to the Granville Bridge to create future development sites. Future condominium projects, which do not require the on-ramps to be removed, include Seacliff Properties' site at the corner of Hornby and Pacific Boulevard, where legendary restaurateur Umberto Menghi recently closed his 37-year-old Il Giardino restaurant. Kitty corner to Salt, one block north of Seacliff's site, is the block bounded by Hornby, Drake, Burrard and Davie streets, where Jim Pattison Developments and Reliance Properties Ltd. executives want to build a $500 million megaproject. They still need rezoning, McNaney said. But they plan to find an anchor tenant to kickstart development of a 13-storey office tower at the corner of Burrard and Drake streets. The Burrard Gateway project's two residential towers include a 47-storey building at the corner of Hornby and Drake streets and a 33-storey structure between Drake and Davie streets on Hornby Street. Reliance separately proposes to build a 28-storey residential tower at the corner of Hornby and Davie where a 7-Eleven store now sits. One block south of the Jim Pattison block, at the northwest corner of Howe and Drake streets, Bonds Group of Companies wants to build the 41-storey, 228-unit Tate on Howe tower. Other downtown South projects include ones by Wall Financial and Onni on Richards Street.